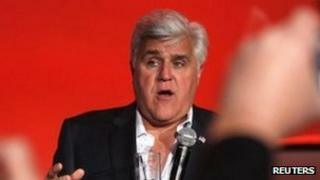 India has condemned a comment by US comedian Jay Leno on the holiest Sikh shrine, the Golden Temple of Amritsar. A Leno skit showed the temple as the summer home of Republican presidential candidate Mitt Romney. Mr Romney has faced taxation questions over his huge wealth and many Sikhs are angry the temple has been depicted as a place for the rich. The Sikh community has launched an online petition and an Indian minister called the comments "objectionable". Overseas Indian Affairs Minister Vayalar Ravi told reporters: "It is quite unfortunate and quite objectionable that such a comment has been made after showing the Golden Temple." Mr Ravi said the Indian embassy would take up the matter with the US state department, the Press Trust of India reported. He said: "The Golden Temple is the Sikh community's most sacred place... The American government should also look at this kind of thing. "Freedom does not mean hurting the sentiments of others... This is not acceptable to us and we take a very strong objection for such a display." The skit appeared on The Tonight Show with Jay Leno on NBC television on 19 January. The online petition organised by members of the US Sikh community says Leno has been guilty of derogatory comments on Sikhs before. It adds that "Jay Leno's racist comments need to be stopped right here". Petition signatory Simran Kaur says: "Jay Leno must apologise and promise not to make any direct or oblique references to Sikhs or their places of worship." Leno has not yet commented on the matter. Mr Romney has been criticised by rival presidential candidates over his reluctance to release taxation records, which will reveal his earnings and the taxes he pays. On Sunday he agreed to release his income tax records for 2010 and estimates for 2011.